Sarah Tiefenthaler, owner and founder of YOGAqua, completed her first 200-hour Yoga Teacher Training in the tropical jungles of Costa Rica where she focused intensely on the philosophy of Yoga as well as meditation practices. When she returned to Los Angeles, she completed her second 200-hour Yoga Teacher Training certification in Hollywood, CA at Earth’s Power Yoga where she was able to expand her knowledge of human anatomy and alignment in relation to Yoga. After spending day after day in the magnificence of the Costa Rican jungle, Sarah still longed for any activity in which she could maintain a consistent presence in nature.When Sarah returned home from Costa Rica in 2010 she soon discovered her passion for Stand Up Paddleboarding (SUP); it was the perfect solution that would keep her out in nature, on the water, and under the sun. With her obvious passion for Yoga, it was not long before she began to experiment with Yoga poses on the boards which was just the spark that very quickly lead to the creation of her SUP Yoga company, YOGAqua. YOGAqua was launched on July 17th, 2011 and is based in Marina Del Rey, CA. Sarah has since completed her third Yoga Teacher Training for 100 hours at Maha Yoga in Brentwood, CA. She offers SUP Yoga Teacher Training Certification courses four times per year as well as SUP Yoga Retreats at some of the most beautiful locations around the world. She is the SUP Yoga Program Coordinate for Wanderlust Yoga Festivals, a Reebok Athlete and a brand ambassador for BOGA Yoga Paddle Boards. Stephanie Schwartz has always sought ways to bring balance, health, and fun into her life. Yoga has become an integral part of that process. It is a place where she can be herself, confident and comfortable in her body and its strength, along with its goofy inner core. A couple of years ago, on an adventure to the North Shore of Oahu, hiking with friends, Stephanie came across a floating yoga studio at a secluded beach. Intrigued, she carefully determined that no one was around, and quickly hopped on a board to play—and in a moment was hooked. Through a chance encounter with a yoga teacher who soon staked claim to the floating studio as her “office”, a seed was planted. Back on the mainland, it took about a year before Stephanie found a local floating studio to make part of her regular practice—and subsequently learned that the owner, Sarah, was the same teacher she had crossed paths with a year before. The opportunity to join a YOGAqua teacher-training program presented itself a few months later and Stephanie never looked back. She is also a certified yoga instructor through the National Council for Personal Trainers (NCCPT). Most weekends you can find her practicing, playing and laughing in Marina Del Rey with the YOGAqua family. Adèle Borden moved to sunny LA by way of New York, Boston, and the South of France. She began practicing yoga as a kid, alongside a busy schedule of lacrosse, field hockey, and ice hockey. After college, she took on half marathons and marathons, but an ankle injury forced her to slow down. This is when yoga took on a more prominent role in her day-to-day, and now she can’t imagine a week filled without it. While Adèle was getting her film/TV MFA at USC she began her 200-hour RYT training at Love Yoga in Venice with Katonah teachers Kyle Miller and Sian Gordon. The next year she tried her first SUP yoga class, and quickly fell in love. Being on the water infused the practice with a feeling of peace, inspiration, and playfulness that Adèle hadn’t encountered anywhere else. She signed up for her 40-hour SUP yoga teacher training with YOGAqua that week, and has since assisted with the SUP yoga classes at Wanderlust. Adèle’s classes are mindfully sequenced to build strength and flexibility, and help you find a new perspective. Growing up near the beautiful beaches of Southern California and Sydney, Australia, Karina Moore has always had a love for the ocean. As a child her passions included competitive swimming and gymnastics. Later in life she transitioned her workout to yoga (what she considers the adult version of gymnastics), which she has been practicing now for over 15 years.In 2012 Karina left Colorado and returned to her beachside roots, moving to sunny Redondo Beach, CA, where a neighbor introduced her to a standup paddleboard. 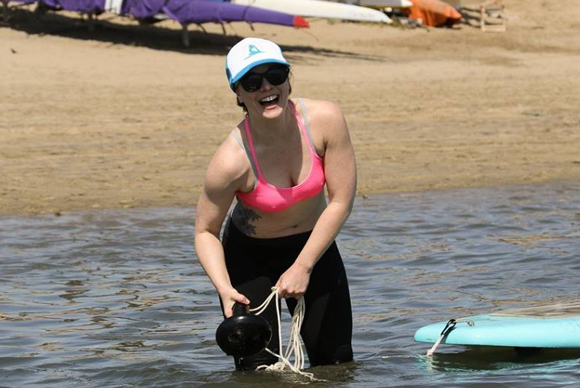 Despite falling 3 times into the open ocean on her first foray, she was hooked. She felt a balance and stability that was both challenging and addicting. Countless days were spent embracing the cardio core workout of chasing sea lions, dolphins, and whales around the Pacific. One day a friend said “Did you know you can pair your two loves—yoga SUP?” She attended her first SUP Yoga class in 2013 and hasn’t looked back. She has since been inspired to obtain her YOGAqua SUP Yoga teacher certification, as well as the RYT 200-hour teacher training certification during a month long retreat in Nicaragua. Balance on and off the mat (and board) is paramount to her. Karina leads classes with an inclusive approach, a heartwarming message, and a physical challenge that will leave you feeling accomplished. While attending graduate school in Baltimore, MD, Tangi Holmes discovered her love for yoga. It was the way that yoga made her feel physically, mentally, and spiritually, allowing her to have a more balanced and peaceful outlook on life. After graduation, this Mississippi girl moved to L.A. and continued to develop her practice. Tangi was introduced to SUP Yoga through a friend who was visiting and convinced her to go to class. She instantly became intrigued and knew she wanted to experience more. Tangi set out to find a practice closer to where she lived, and that’s when she came across YOGAqua. 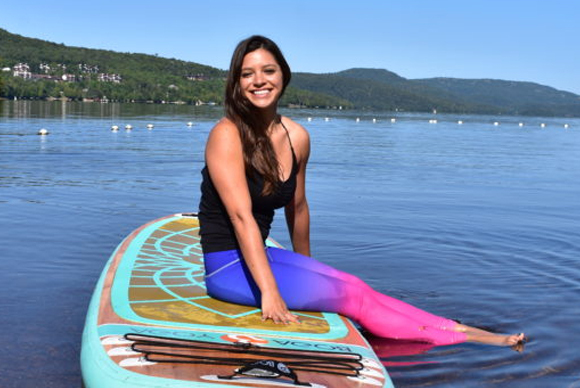 She took a class and knew right away that it was a perfect match for her to bring her love of yoga into nature and enjoy the water in a new and exciting way. Wanting to learn and understand yoga more, Tangi enrolled into the Tamal Yoga School and received her Yoga Alliance Certification. Soon after, she knew that she needed to learn and understand her love for SUP Yoga more as well. She enrolled in the teacher training program at YOGAqua where she received her SUP Yoga Instructor Certification and WPA Level 1 Certification. Tangi is more than excited to be a part of the YOGAqua family, and can’t wait to share her love of SUP Yoga with her students! Courtney Regan has always lived and loved an active life. Growing up in Dearborn Michigan she was a dancer, competitive swimmer and played both basketball and softball. Her passion for athletics and movement took her to Tempe Arizona where she studied Kinesiology and Dance at Arizona State University. In a dance studio on campus Courtney took her first yoga class. It was hardly love at first down dog. In fact she giggled through half the class. A couple years later she gave yoga a second chance and found nirvana through asana. After years of personal practice Courtney decided to attend The Southwest Institute of Healing Arts and received her RYT 200. In the Summer of 2014 she decided to shake up her life and start a new adventure with a move to sunny Santa Monica. It was here, at Mothers Beach, she was introduced to SUP. She had never experienced such excitement and peace as she did on the board out in the water. It was time for a new adventure in 2016. She found YOGAqua and immediately registered to train with Sarah. Courtney’s classes are a reflection of how she lives, balanced. Courtney enjoys teaching athletic classes that are mindfully sequenced for all levels of experience. She wants her students to find the same excitement and peace she does in her own practice. 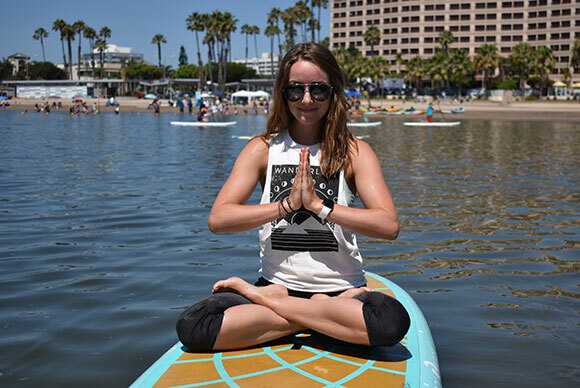 Most of all Courtney wants her students to find pure joy; on the water, in the sun, experiencing SUP yoga with YOGAqua! Small-town girl from Northern California, Allyson loves spending time being active in the outdoors hiking, running and biking. Allyson began her yoga practice after a running injury forced her to slow down and take a break from marathon training. Yoga offered that balance that was missing from her routine and needed in order to heal. It was during this time of transition she was also introduced to paddleboarding by a friend . Paddleboarding quickly became a new passion and right away she began working at an Aquatic Center so she could paddle as often as possible. Before moving to Los Angeles she earned her Bachelor’s of Science in Recreation, Parks and Tourism Administration from Sacramento State University and completed teacher training at YOGAqua in March 2017 followed by her 200 RYT through Yoga Alliance under Tamal Dodge in the Spring of 2018. Now Allyson can’t get enough of the water and spends every weekend assisting classes and teaches the sunset paddles on Friday evenings. Jasmin Figueira, a native of the San Francisco Bay Area, has been a dancer, lover of nature, and water aficionado all of her life. After earning her Bachelor’s degrees in Communication and Public Relations, she moved to Los Angeles to continue her professional dance career, which began in Paris at the age of fifteen. As a constant mover and shaker, dance naturally transitioned her into yoga, where it was love at first Chaturanga. Her student mentality created a craving to understand the alignment, anatomy, and philosophical principles of yoga, which inspired her to share its healing potential. She received her 200-hour Yoga Teacher Training with Corepower Yoga in Power Vinyasa Flow, with additional certifications in advance and intermediate levels, pre- and post-natal yoga, Yoga Sculpt incorporating free weights, and also Dance Movement and Yoga Therapy at Loyola Marymount University. Her first YOGAqua class in the Summer of 2015 changed her life. She could not stop smiling as pure bliss flooded her body, mind, and spirit. It was only time until she completed her SUP Yoga and WPA certifications so that she could give back what she has so gratefully received through all that Yoga and YOGAqua have to offer. Jasmin’s mission is to inspire, empower, and encourage her students to THINK: to be True, Humble, Inspiring, Necessary, and Kind. She leads international yoga retreats, private lessons, and teaches in studios throughout Los Angeles. Emily Smith took her first yoga class in 2006 and hasn’t looked back since. Believing strongly in the mind/body connection, she loves how SUP Yoga integrates both of these aspects on the water to calm the mind while challenging the body in a new environment. It’s hard to stay in your monkey mind when you are worried about falling in! Considering herself a lifelong learner, she has multiple certifications which influence her playful teaching style. Emily has 200-RYT from YogaWorks, Pre/Post Natal yoga training, Children’s yoga training, Urban Zen Integrative Therapy Level 1, and a Masters Degree in Clinical Psychology, in addition to her SUP Yoga training from YOGAqua. She is excited to share her practice of SUP Yoga with you in our beautiful harbor location! Dave Manning has been training in the martial arts for over 50 years. He holds several black belts and is currently studying IAIDO (Traditional Japanese Samurai Sword Martial Arts) and SHIN SHIN MUGENDO (Traditional Japanese Mixed Martial Arts). Dave has been practicing yoga for 10 years and has been teaching weekly classes since 2015 at Inner Power Yoga in Woodland Hills California. He holds a 200 hour Yoga teacher training certificate and is currently enrolled in a 300 hour Yoga teacher training. Dave is certified as a SUP Yoga instructor and a World Paddle Board Association Class 1 Instructor. 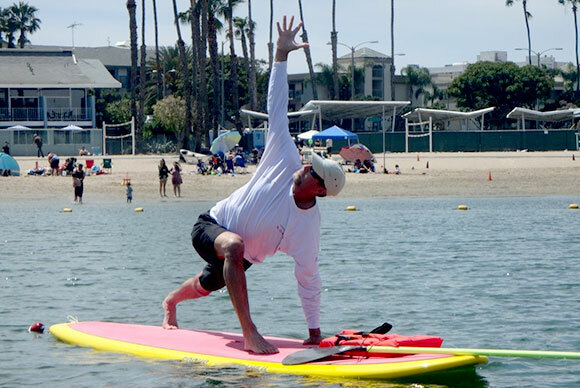 He teaches SUP Yoga for YOGAqua in Ventura and Marina Del Rey, California. Leah Vernon completed her 200 hour training through Dancing Shiva Yoga and Ayurveda in Ventura, CA followed by a week of intensive training in Long Beach. Just a few short months after her training, Leah and her family left for her husband’s next 3.5 year military tour. This time, they were stationed on the beautiful Hawaiian island of O’ahu. It was during that move that she fell in love with S.U.P. Yoga, completed a training on the mainland, and after returning to Hawai’i was inspired to start her own business, Yoga Kai. Knowing her time on the island was precious, she led multiple classes daily, led numerous Yoga Kai teacher trainings each year, built a team of fun energetic yogis and helped grow the S.U.P. Yoga presence around Hawai’i. Leah and her family were fortunate enough to get re stationed in what they consider their “home”, Ventura, CA. Vali O’Grady was born and raised in Southern California and has always been physically active from a young age. She was a spin instructor for over 12 years and also a crossfit instructor. She was an avid runner from trails to the streets and ran numerous half marathons and one marathon along the coast of Maui. She moved to Santa Monica in 2012 and that is when she took her first yoga class. After one yoga class Vali was addicted. She learned quickly it was a lot harder than she had imagined but most importantly, how it calmed her soul. Around that same time she started paddleboarding and fell in love with being on the water. It gave her that same peaceful feeling that yoga did. While out on the water Vali saw a SUP Yoga class and knew this was something she needed to try. It took her yoga practice to a whole new level. Vali realized it made her more mindful in going into the poses and it isn’t about the final destination but the journey along the way. Being on the water doing yoga feels like home to her. In early 2017 she completed her 200 HR Yoga Teacher Training and then quickly moved on to get certified at YOGAqua to instruct SUP Yoga. She realized through taking both certifications how much she had missed teaching. Vali loves sharing her passion for yoga with others and motivating students to take it beyond what they think they can do. Her favorite moments as an instructor are when she sees that smile or “Ah ha” moment on a students face as they realize how much fun they are having and also the student’s realization they exceeded their own expectations. That is what makes teaching so worthwhile to her, to help students find their wings so they can fly.